This video doesn't exactly address transportation, but I think the message could be applied to how we choose to get around too. I thought it was kind of fitting and maybe a friendly warning to those of us who spend a little too much time letting the car idle or driving to the store that's two blocks away, instead of walking or biking. City Link is looking for a new home for it's park and ride services, after being evicted from the Riverstone development. Riverstone's developer says the parking spots being used by bus riders are needed for patrons of the new businesses opening up at Riverstone. Here's more on this story. 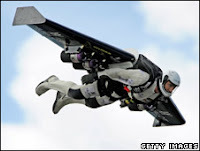 Man Flies 22 Miles Using Jet Pack. Incredible Video! You thought they were just a gimmick used on 'The Jetsons,' but a Swiss man has become the first person to fly solo across the English Channel using a single jet-propelled wing. That's right, the man ignited jets on a wing on his back, jumped out of the plane that had taken him up, and flew 22 miles in less than ten minutes! Here's the video, and it's amazing! October starts next week, which means National Walk You Child To School Month is also coming right up. So instead of taking the easy way and driving your kid the few blocks it takes to get them to school, try walking instead. It's better for your health, your wallet, and the environment. And if you have any questions or need more information, here's a link to the International Walk Your Child To School website. Citizens who attended a community forum on the downtown Coeur d'Alene education corridor project had lots of questions about how it will affect traffic in the area. Many are worried the corridor will create congestion in the Fort Grounds Neighborhood. Here's coverage of the meeting from the Coeur d'Alene Press. Did you know that the average salary for a pizza delivery driver in Coeur d'Alene is $11,000? Neither did I. Was browsing the web when that fact popped up on the 'Simply Hired' website. And I was surprised. They may get paid $11,000 per year, but how much of that goes back to buying gas? I did a little research and found that the average U.S. driver goes through 500 gallons of gas per year (and pizza delivery people aren't considered average drivers so they would use more than that). At the current price of around $3.60 a gallon for unleaded, that comes to $1800. So that brings them down to about $9,000 a year! Yikes, hope they're getting free pizza so they can at least eat. Fall Means Falling Leaves, Not Falling Snow! Let's not rush things! I know Monday was the first day of fall, but someone up above is trying to skip that season and go right to winter. 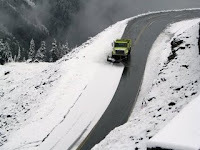 A freak snow storm in the Cascades this week left several inches of snow on the pass. Here's a look, from the WSDOT blog. Lynn Humphreys, chairman of the Post Falls Highway District, spoke at a forum last night at Post Falls City Hall on the proposed $24 local option vehicle registration fee increase. His take: That funding shortfalls for road projects have gotten to be a "runaway train" and that if the proposal fails, some lesser-travelled roads in the county will likely revert back to gravel because funding isn't there to maintain them. Here's the Coeur d'Alene Press' coverage of the story. and Here are some frequently asked questions about the fee increase from the KMPO website. Plans to improve U.S. Highway 95 between Coeur d'Alene and Sandpoint into a four-lane, divided freeway are being delayed. Escalating costs, concerns about the economy, and uncertain federal highway funding all have contributed to the delay in the completion of the 31-mile freeway project. Here's more on this story. The Ray and Joan Kroc Community Center has come up short of its $200,000 goal to pay for a traffic signal at the Ramsey and Golf Course Road intersection. So far, it's only landed a $25 donation from a private resident and a $5,000 pledge from another. Borrowing Against Future Funding: Good Or Bad Move? If you've been dying to get your two cents in, this is your chance. The Spokesman-Review's 'Huckleberries' blog today is taking an unofficial survey asking 'Did Idaho leaders make the right choice to borrow against future federal highway payments to cover road projects? 'Here's the link to voice your opinion. Contractor's crews will begin paving U.S. 2 from Sandpoint to Dover tomorrow. Work is expected to be completed by Oct. 14. The old pavement surface will be ground down for a full-width resurfacing with new asphalt. U.S. 2 will be reduced to one lane weekdays from the Dover Bridge to 5th Street in Sandpoint. The speed limit will be 35 mph through the work zone corridor. Slow down when driving through area school zones, more than 300 drivers have been ticketed for speeding in school zones in the Spokane and Kootenai County area since Sept. 2, and officers are looking for more speeders. Here's your warning. A reminder that KMPO's Public Involvement Policy (PIP) has recently been updated and is available for public comment through Oct. 13. The PIP provides methods for community engagement, communications, and the solicitation of public comment. The update is needed to meet federal and state public participation requirements in carrying out statewide transportation planning processes. The Public Involvement Policy can be viewed by clicking here. Comments can be submitted by clicking here. Governor Otter and the Idaho Transportation Department recently concluded the seventh in a series of statewide meetings asking the public how best to pay for repairing, maintaining and improving the state's crumbling roads and bridges. 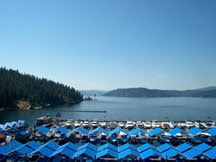 If you couldn't make it to the meeting in Coeur d'Alene in July, you can still submit comments and take a survey on your opinion of Idaho roads. Here's a link to submit comments and take the survey. Wolf Lodge Creek Bridge - The existing bridge deck will be rehabilitated using a hydrodemolition removal process, with a concrete overlay on the bridge surface. Golconda Overpass Road Interchange - The approaches to both the east- and westbound structures will be repaired, and a new drainage system installed. The expansion joints will be replaced and a new surface put on the bridge deck. South Fork Coeur d'Alene River Frontage Road, UPRR Bridges - The existing asphalt surface will be removed, the deteriorating concrete replaced and a concrete waterproofing system will be installed. The expansion joints will be repaired and the bridge decks will be paved with a new asphalt surface. A reminder that guardrail painting starts tonight, and I90 between Coeur d'Alene and the Idaho-Washington line will be reduced to a single lane in both directions . The speed limit will be reduced to 55 mph. Once again citing volatile fuel prices, United Airlines has doubled its fee for a second checked bag to $50. United has several flights out of Spokane International Airport. Here's your early warning; the eastbound Sherman Avenue off-ramp (Exit 15) on Interstate 90 will be closed Monday (Sept. 15) from 9 a.m. to 4 p.m. while maintenance crews remove and repair damaged guardrail. You will still be able to access the Sherman Avenue on-ramp though. Around here, you have to worry about inattentive drivers, dogs, and poor road conditions when you ride your bike to work. In Missoula, one man had to worry about hitting a bear. That's right, the man rode his bike right into a bear, travelling at about 25 miles per hour! Here's the story. Last night's US95 Access Study had a good crowd. Over 50 people showed up to study the proposed alternatives to improve safety, access, and mobility on US95 from I90 to SH53, ask questions, and submit comments and their prefered improvement option. It was a busy night around town though, and we heard from several people who couldn't make it to the meeting who would like to have their voice heard. If that's you, don't worry, you can still weigh in. Start by checking out the Study background and alternatives, then let us know which is your favorite by filling out the comment sheet, or emailing us with your comments. Try to get any comments in by Sept. 16 though, we're trying to wrap this study up. Starting tomorrow (Thursday) morning, Hubbard Avenue will be closed to through traffic through the abandoned mill site. With the demolition of the Stimson Mill and railroad tracks being pulled from the area, it is necessary to close the street for safety reasons. This street is partially privately-owned through the mill site but is used by the general public as a pass-through to the Fort Grounds neighborhood and college in order to avoid the traffic light at Northwest Boulevard and Government Way. Access to Harbor Center from Northwest Boulevard will be unobstructed, and access to the Wastewater Treatment Plant will be limited. When demolition is completed, access issues will be re-evaluated. A groundbreaking ceremony is scheduled for tomorrow to mark the beginning of a two year project to improve Fernan Lake Road. The $17 million project will repave nearly 11 miles of the road, widen the roadway in places and smooth out curves. The ceremony is at 1 p.m. tomorrow and includes the Federal Highway Administration, the United States Forest Service, and the Eastside Highway District. 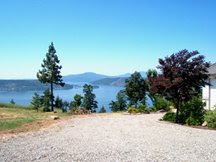 Here's more information from the Coeur d'Alene Press. This is your last reminder that KMPO and the Coeur d'Alene Chamber of Commerce are hosting a public open house tomorrow afternoon/evening to view low-cost alternatives for improving safety and mobility on US95 between I-90 and SH53. The meeting is from 4-7 p.m. at Centennial Distributing, 701 W. Buckles Ave. A presentation will be made at 4:30 p.m. and repeated at 6 p.m. Before and after the presentations, exhibits and study staff will be available to explain and discuss alternatives. Here's an article the Coeur d'Alene Press ran on the meeting today. Crews will repaint the pavement markings on Interstate 90 on- and off-ramps beginning this Sunday night (Sept. 7). The work is part of a roadway resurfacing project between the Washington state line and Sherman Avenue (Exit 15), which will extend the life of the roadway. Public convenience is a major factor in planning interstate construction projects. Work will take place from 6 p.m. to 6 a.m. through Sept. 16, including the weekend. The westbound off-ramp at the Idaho 41 interchange will be closed to traffic on Wednesday and Thursday (Sept. 10 and 11) during the nighttime hours. This is the only ramp that will require full closure while the pavement markings are repainted. Work is expected to be complete by mid-October. New vehicle prices are falling at the fastest rate recorded, according to a team of analysts that includes auto and economic researchers. A research report released this week says the average price of a new vehicle fell 2.3% from a year earlier to $25,632. That's the steepest drop recorded since new car sales tracking began 41 years ago. The price decline expected to lead to better affordability and could translate into a big recovery for auto sales by the second half of 2009. Coeur d'Alene City Council Members have approved the creation of an ADA Hazard Abatement Account for sidewalk repairs. The account will fund repairs for ADA sidewalk deficiencies that are included in a 5-Year Priority Plan that will be updated and approved by the City Council on a yearly basis. The account is expected to fund approximately 5,000 lineal feet of sidewalk repairs per year. Tied to foregone taxes, this account will start at approximately $200,000 per year. The impact of this cost is estimated to add $0.05/$1,000 of assessed value to property taxes. This equates to $10/year for a home with a net valuation of $200,000. Sidewalk repairs will be prioritized based on need and use. The ADA Hazard Abatement Program covers only ADA compliance issues. This is not a complete sidewalk replacement program. The goal is to accomplish ADA compliance and meet pedestrian safety issues. The Post Falls City Council approved a $15.4 million general fund budget this week, which includes $20,000 for sidewalks and curb ramps, $10,000 per year to improve intersections, and $270,000 for street maintenance. In additon, City Council will hold a transportation plan workshop Oct. 7 to address street maintenance funding and explore alternative methods to chip sealing.Here's the details. KMPO and the Coeur d'Alene Chamber of Commerce invite you to a public open house to view low-cost alternatives for improving safety and mobility on US95 between I-90 and SH53. 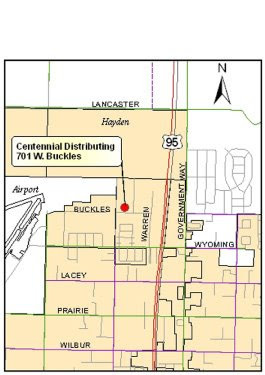 The meeting is Tuesday, Sept. 9 from 4-7 p.m. at Centennial Distributing, 701 W. Buckles Ave. (see map). A presentation will be made at 4:30 p.m. and repeated at 6 p.m. Before and after the presentations, exhibits and study staff will be available to explain and discuss alternatives. An editorial in today's Spokesman-Review calls for ITD to deliver a high-quality bypass through Sandpoint, while maintaining the city's lakefront image. A lot of people don't agree that a bypass is necessary though. I know this isn't a Kootenai County issue, but a lot of us visit Sandpoint for a variety of reasons, and the last time I did, I sat in traffic for what seemed like forever, then couldn't get turned around when I took a wrong turn until I got almost out of town. What's your take on the situation? Speed limits go back up around area parks this week, but down around schools. Here's what it will cost you if you if you're caught speeding in a school zone. This could be the chance you've been looking for to voice your opinion on Transportation issues in Post Falls. 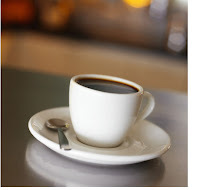 Mayor Clay Larkin invites you to “Have Coffee With the Mayor" this Friday, Sept. 5 from 9-10:30 a.m. in the second floor conference room of Post Falls City Hall. This is an informal gathering for citizens to share comments with or ask questions of Mayor Clay Larkin and City Administrator Eric Keck, so start making your list. Keep your eyes open this month folks, the City of Coeur d’Alene begins its annual fall street striping in September. Street striping requires clean, dry streets and reasonably warm temperatures. It takes over 1,300 gallons of paint and nearly 5 tons of glass beads. The work takse about 10 days of good weather and is done only in the daytime when the weather is warm enough for the paint to dry quickly. A pilot car with warning signs is used, when possible, to alert motorists in areas where striping is taking place, but City officials ask you to be observant as it's not always possible to use a pilot car.